Save your bathroom from excess moisture and the problems that come with it—from cracked paint to mildew growth—with this shopping guide and our top picks. Nothing beats a hot shower at the end of a long day. But while the steamy water works wonders on your nerves, it has the opposite effect on your bathroom—especially if the enclosed space isn’t properly ventilated. Excess humidity settles on every available surface in a bathroom, causing damage in the form of cracked paint, peeling wallpaper, and warped cabinetry. What’s more, the buildup of moisture also encourages mold growth in drywall and caulking, which threatens indoor air quality. 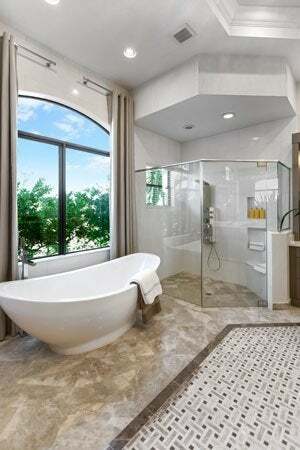 Some homeowners can ventilate their bathroom by opening a window after every bath or shower. Those without windows, however, should consider installing a bathroom exhaust fan. The best bathroom fan removes excess moisture to save your bathroom from damage, eliminate mirror fog, remove odors, and—most importantly—protect your family from mold-related health problems. When shopping for a bathroom fan, you’ll find options available in a wide range of prices, from around $50 for a bare-bones model to a couple hundred dollars for high-end models that include lighting, heaters, and motion sensors. Add to the cost of the unit a professional installation for another $200 to $400, and it turns into quite an investment. Given the sum of expenses, homeowners must understand the ins and outs of bathroom fans before pulling out their credit cards. Here’s our guide to the best bathroom fan on the market today. Bathroom exhaust fans are measured in cubic feet per minute (CFM), which gives the amount of air moved by the fan each minute. The product’s box will list the CFM number, and it will typically give a suggested room size as well. As a general rule of thumb, homeowners should buy a fan with a minimum CFM rating that equates to your bathroom’s square footage. For example, you’ll want a 50 CFM rated fan for a 50-square-foot bathroom and a 100 CFM rated fan for a 100-square-foot bathroom. Suppose your bathroom is 8 feet wide, 10 feet long, and 8 feet high. Then you’d multiply 8 by 10 by 8 by 0.13 for a total of 83.2. In this case, a fan with a CFM rating of 80 would probably be sufficient for your bathroom. In addition to CFM measurement, consumers should consider a fan’s noise level. The noise emitted by an exhaust fan is rated in “sones,” and most fans have a sones rating between the range of 0.5 to 6.0. The lower the sones number (which is typically printed on the fan box), the quieter the fan will be when operating. Since a sones ratings of 1.0 compares to the sound of a quiet refrigerator, any fan with a sones rating of 1.0 or less is considered very quiet. On the other end of the scale, a sones rating greater than 4.0 might be loud enough to drown out your shower singing. 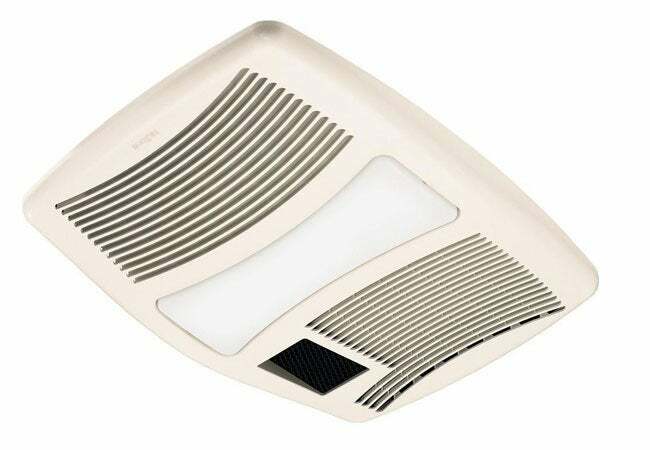 Nowadays, many manufacturers produce bathroom fans that operate quietly. If you’re very worried about sound, consider installing a 6-inch ducting attachment for your fan rather than the standard 4-inch attachment. 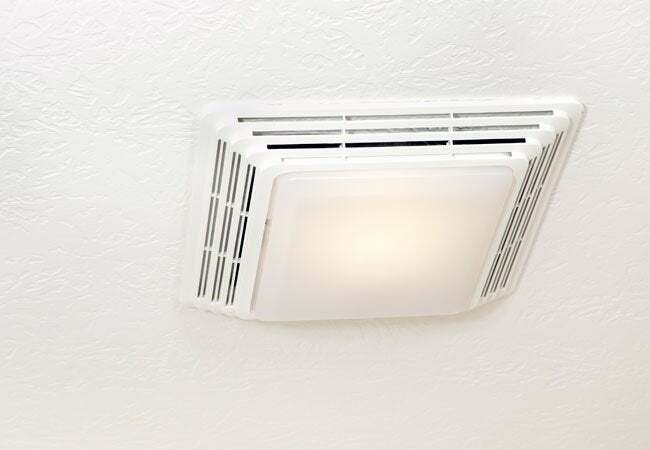 Air can move easier in a wider duct, so 6-inch duct puts less strain on the fan and allows for quieter operation. Many homeowners opt for a bathroom fan with an integrated light. These fan/light combinations allow the buyer to remove their current light and install the new fixture with the existing wires, making installation easy. Some of these models also have motion sensors that automatically turn on the light when someone walks into the bathroom. Other optional features in bathroom fans include humidity sensors that activate the exhaust fan when the moisture levels reach a specific level, nightlights that offer a comforting glow for midnight bathroom visitors, and built-in heaters that warm the bathroom quickly on chilly winter mornings. Keep in mind that some features can add anywhere from $50 to $200 to the fan’s price. When you draw moisture-filled air out of the bathroom, it needs somewhere to go. Some bathroom vents release exhaust into a home’s attic; however, this setup isn’t ideal, since excess moisture in the attic can lead to mold-related issues. Therefore homeowners should opt to vent their bathroom fans to the outdoors. If the bathroom is located on the first level of a multi-story home, you’ll want to vent the air through the side of your house. 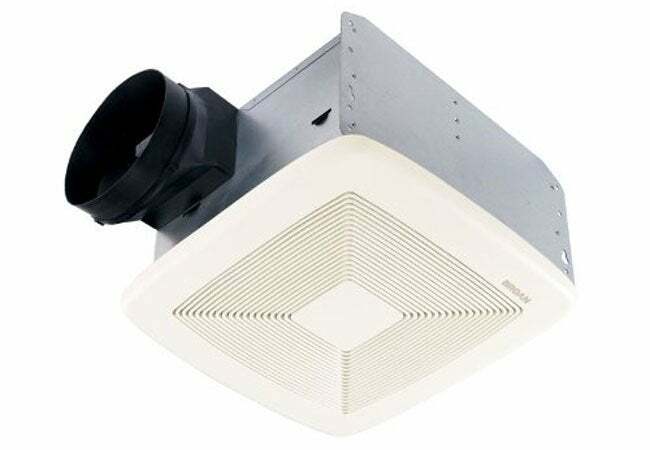 A standard ceiling-mounted fan is suitable for this type of venting, as long as you can run the ducting through the ceiling joists to an exterior wall. If you can’t run ducting between the joists, and if your bathroom has at least one exterior wall, you can install a wall-mounted fan that vents the exhaust directly out the side of the house. For any bathroom located on the floor directly below the attic, your best bet is to direct the vented air to the attic and then, via ducting, either to a soffit under the roof’s eave or out through a vent pipe in the roof. Homeowners should install a new bathroom fan between the shower and toilet, in an area of the ceiling without any obstructing joists or pipes. Replacement fans should be installed in the same location as the existing fan. Keep in mind that larger bathrooms may require multiple fans to effectively ventilate the space. Fans with added features—such as lights, heaters, and nightlights—may require additional wires or a designated circuit to operate. Follow manufacturer guidelines for specific directions, and consult an electrician if you’d like. Using the criteria outlined above, expert opinions, and consumer reviews, we’ve rounded up three choices for the best bathroom fan on the market today. Having a properly ventilated bathroom has never been so easy! For its affordability and nearly silent operation, The Spruce speaks highly of the Broan QTXE080 Ultra Silent Bath Fan, calling it “a great deal from a solid manufacturer.” The fan receives an admirable 4.5 stars from Amazon buyers, who rave about its quiet 0.3 sones rating. With 80 CFM ability, this Broan model is designed for small- to medium-sized bathrooms up to 75 square feet in size. The Energy Star qualified unit has top-notch moisture-reducing performance and a large 6-inch ducting attachment. Homeowners needing a basic fan without added features or lighting can consider the Broan QTXE080 a safe bet. Available on Amazon. Panasonic, a leading bathroom ventilation fan manufacturer, produces some of the most popular exhaust fans on the market. Consumer Reports recommends the Panasonic WhisperGreen fan for a “fog-free bathroom without the racket” of a traditional noisy fan. Amazon buyers agree, awarding the WhisperGreen a resounding 4.3 out of 5 stars. With three operating speeds that correlate with 50, 80, and 110 CFM ratings, the WhisperGreen is suitable for small, medium, and large bathrooms. A sones level of less than 0.3 ensures an extremely quiet operation. The model comes with two additional ports for adding customized features, such as a condensation sensor, an LED nightlight, or a motion sensor (each sold separately). 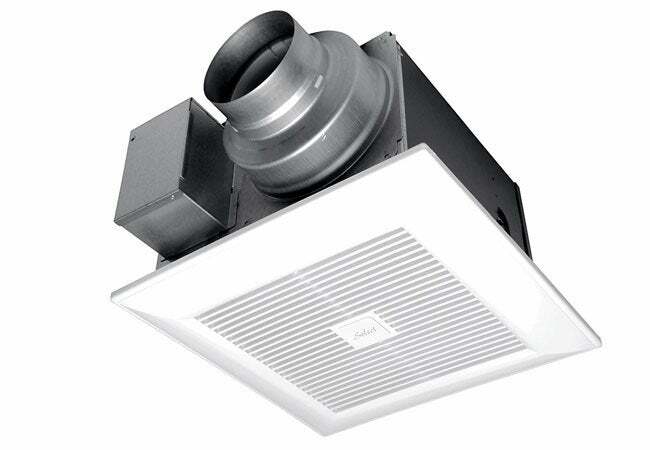 The dual duct adapter allows the fan to work with either 4” or 6” ducting. Available on Amazon. Best Consumer Reviews gives the NuTone QTXN110HL Ultra Silent Bath Fan its highest approval rating. Although the fan has a steep $300 price tag, it includes several impressive features, such as an overhead light, a 1,500-watt heater, and a soft-glow nightlight. Some Home Depot customers rave about the fan’s fast-working heater and ventilator. Since the fan has ratings of 110 CFM and 0.9 sones, homeowners will hear a low gentle hum when the fan is operating. The NuTone QTXN110HL comes with a 6” ducting attachment for optimal performance, and it works best for bathrooms smaller than 100 square feet. Keep in mind that the fan needs a dedicated 20 Amp circuit in order to provide sufficient electricity to power the heater. Available from Home Depot.